NASHVILLE, Tenn. (March 26, 2019) — The Country Music community is rallying in support of fellow Grammy winning artist, John Berry, who is currently undergoing chemotherapy and radiation treatments for throat cancer discovered in January. A concert, silent auction, sponsor opportunities and more will be included as ways to donate. The concert will be held on April 23rd at City Winery at 7 pm. Tickets go on sale at 3 pm CDT today and will be available here. 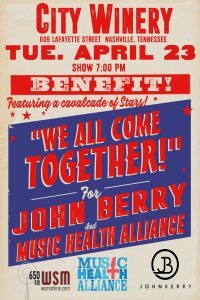 The benefit, “We All Come Together” for John Berry and Music Health Alliance,will raise money to offset the medical expenses not covered by insurance for Berry and a portion of the donations will go towards Music Health Alliance to fund financial assistance to others in the music community. Flagship artists announced this morning by media partner WSM Radio and live-streamed on The Heartland Network on the Cody, Coffee and Country show include Trace Adkins, Tracy Lawrence and Exile with many more to be announced soon. Over 20 Artists have been confirmed along with special guests and surprises! Stay current with John Berry on social media platforms Facebook, Twitter andInstagram Music is available for streaming on Spotify ,Apple Music and Google Playdownload on Amazon Music and iTunes. Watch video content on YouTube. Website & Content © 2017 John Berry. All Rights Reserved.